The Ronald McDonald House is one of my favourite charities here in Canada. Their goal is to support sick children and their families by providing a home away from home when a child is ill and hospitalized. Illness in a family can be very stressful and it is amazing to have an organization built to provide families with support during difficult times. Each year the Ronald McDonald House organizes a fundraising event called the Red Shoe Crawl. It's similar to a pub crawl but instead of hopping from one bar to another, you hop from one business to another, and often times those businesses are restaurants! Every year there is a crawl hosted on Whyte Avenue and one on 124 Street. 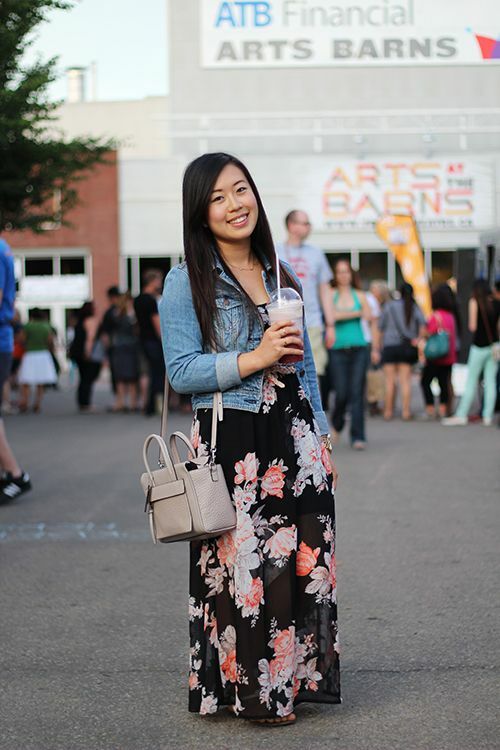 I attended the crawl on Whyte Avenue last year with my mom and we both loved it. On September 14th the Red Shoe Crawl will be happening on 124 Street from 12-5 PM. Over 20 different vendors are participating and all the ticket sales go towards supporting Ronald McDonald House Northern Alberta. At $45 per ticket (or $100/family) you get to eat and shop all in support of a great cause.You can purchase your tickets here and I will see you there! If you want to take your chances, the Red Shoe Crawl has kindly offered me a pair of tickets to give away to a lucky reader! Follow the rules below to enter. To enter you must leave a comment on this blog post answering this question: What is your favourite shop/restaurant on 124 Street? Please make sure you leave a valid email address in the giveaway widget as this is how I will be contacting you. 3. Tweet about the giveaway: "The @Shop124Street #RedShoeCrawl supporting @RMHNorthernAB is coming! Enter to win tickets from @littlmissandrea!" This giveaway is open to everyone able to attend the Red Shoe Crawl on September 14, 2014. All entrants must be 18+ years of age or have guardian permission to enter. You have until September 9th to enter, and the winner will be selected by random and contacted via email. Good luck! Over the past few years food trucks in Edmonton have really come out in full force. I remember back in the day when we had about 2 trucks and I was so jealous that other cities had enough to host food truck festivals! Nowadays there are so many trucks out on the street that it is almost impossible to choose which one you want to eat from. I'm always torn between the innovative offerings, but there are always classics that I order again and again. 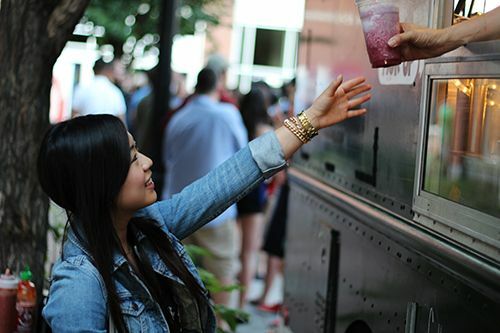 Here in Edmonton our food truck festival is called What the Truck - how fun is that name? The biggest event of the year is coming up on September 12th in Churchill Square. Mark it down on your calendar, folks! With 25 trucks available on site, this is a huge event you don't want to miss. See you there! Special thanks to Molly's Eats food truck for the delicious purple cow! Check her out on Twitter & Facebook. Last week I had the pleasure of attending a media dinner at Sage, the fine dining restaurant inside of the River Cree Resort & Casino. Guests were being treated to a preview of the Taste of Europe tasting menu created by Executive Chef Shane Chartrand which is being featured at Sage from August 26-30. At the start of the meal Chef Chartrand explained that this European menu was created in homage to some of his favourite European chefs. Each course was a traditional dish inspired by a different chef, and Chef Chartrand put his own personal spin on it. The first course was inspired by Jose Andres of Spain: clams and chorizo sausage al ajillo with crispy ensalada. 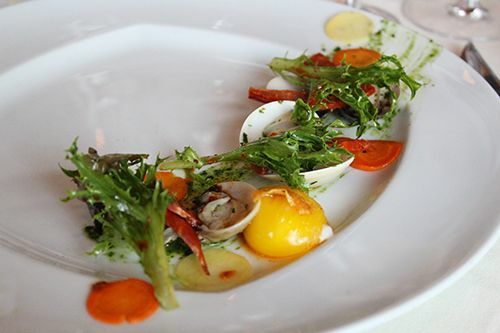 The clams were delicate and fresh, and the greens provided a crunchy texture to contrast the other elements on the plate. Al ajillo translates to "with garlic,"and in combination with the herbs and spicy chorizo the flavours in this dish made it a great starter. But my favourite thing on the plate? That egg yolk! Cooked to just the perfect consistency the yolk bound everything together. Next up was a beef goulash with braised cabbage, potato gherkin cream and spelt bread, inspired by Sven Elverfeld of Germany. Can I just say how beautiful the plate looks? The striking magenta colour immediately caught my eye! 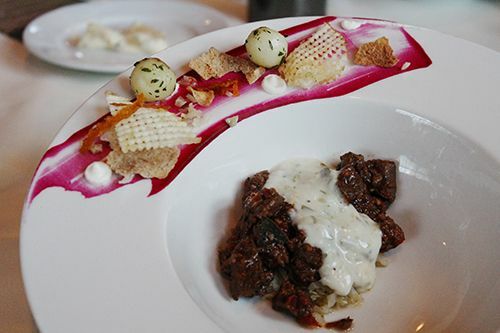 This beef goulash probably looks nothing like what you have had in the past, but I will say that Chef Chartrand's take on this classic dish was fantastic. The beef was tender while the bed of braised cabbage provided a different textural element. The potato gherkin cream on top gave it a light dill flavour and the potato crisps, balls, and bread on the side added more contrasting textures. With the following course we took a trip to Italy for tagliatelle with veal osso bucco, roasted romaine and balsamic foie inspired by Massimo Buttra. 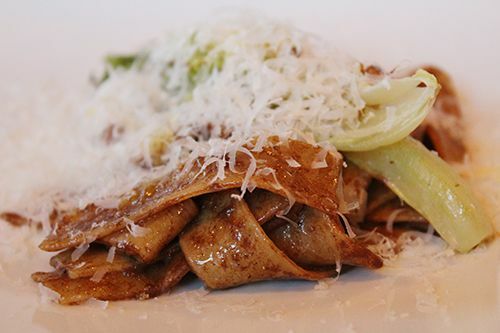 This delicate serving of handmade pasta was nothing short of amazing. The contrasting flavours of balsamic, smoke and parmesan all paired so well together that I wish there had been more on the plate. Texture and flavour was spot on with this dish, and the light sprinkling of panko crumbs gave the dish a wonderful crunch. My boyfriend has officially named this the best pasta he's ever had. The fourth course was inspired by Pierre Marco White of England, and Chef Chartrand gave us his take on cottage pie. 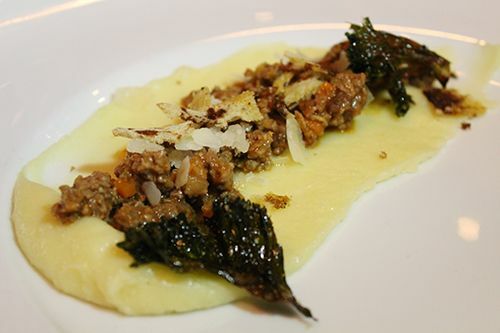 We were presented with a truly deconstructed pie made with tender, flavourful lamb with carrots, crispy kale, and pecorino on a bed of mashed potatoes. There was a good portion of meat on the dish, and I loved the crunchy bits of toast that were sprinkled over top. This plate was scraped clean and spotless when I was done with it! 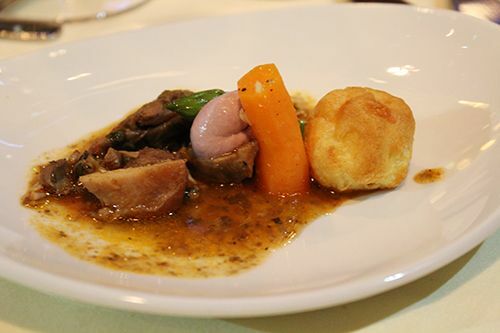 Alain Ducasse of France was the inspiration for our fifth course, which was coq au vin with a burgundy red wine emulsion and gruyere gougeres. The sampling of moist chicken was another winner, but my favourite thing on the plate was the gougere. Light, puffy, cheesy and so easy to eat. I could eat a bucket of them! Swiss chocolate souffle inspired by Peter Goossens of Switzerland rounded off the meal, and it was amazing to see 50 perfect souffles emerge from the kitchen to the dining table. It's no easy feat, but the culinary team pulled it off! 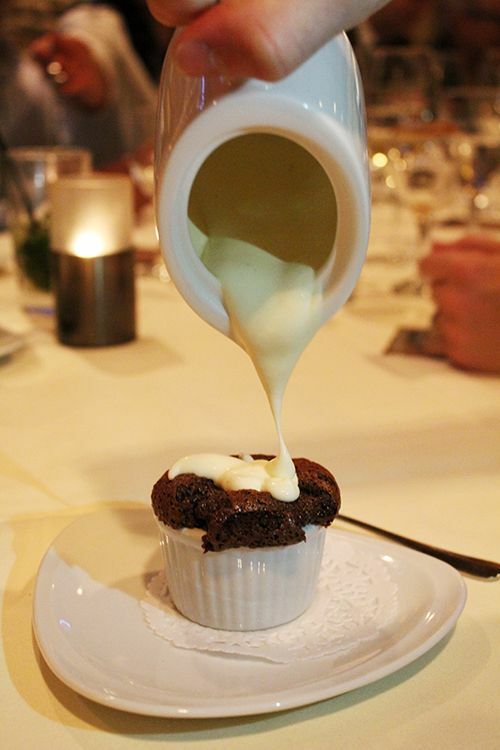 The souffle was decadent, but to make things even better, pots of light creme anglaise were available at the table to pour over dessert. Between you and I, I probably had about half a pot of it. So delicious! Don't tell. Chef Chartrand is an absolutely talented chef and continues to experiment and express his love for cooking. I would highly recommend visiting Sage to see what Chef Chartrand has up his sleeve, and if you have the chance, definitely check out the Taste of Europe tasting menu available this week from August 26-30! At $49 per person, the six course menu (without beverage pairings) is a steal. Portions are perfect and each course is timed perfectly. 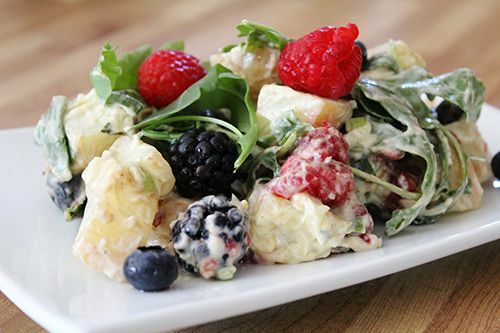 Now go make dinner plans, eat & enjoy! 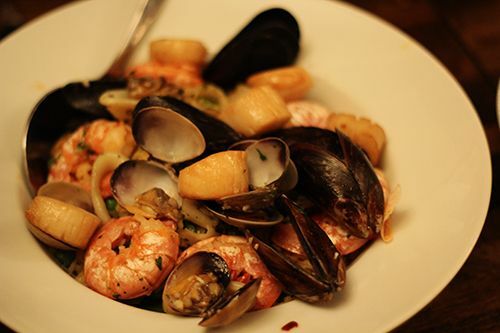 Who loves seafood? I never was a huge fan growing up, but now that I'm older I can definitely appreciate shellfish and the many different varieties of fish out there. A little while ago I had the chance to attend a preview dinner for the annual seafood festival that is held at Sabor Restaurant. 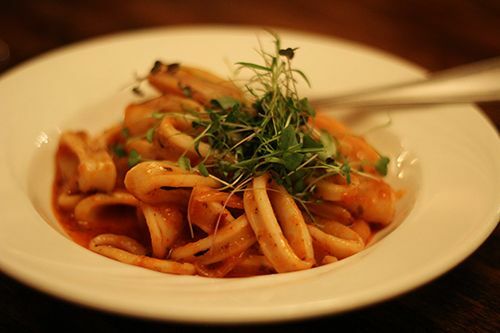 Formerly Sabor Divino, the restaurant has been a prominent player in the Edmonton dining scene since opening six years ago. 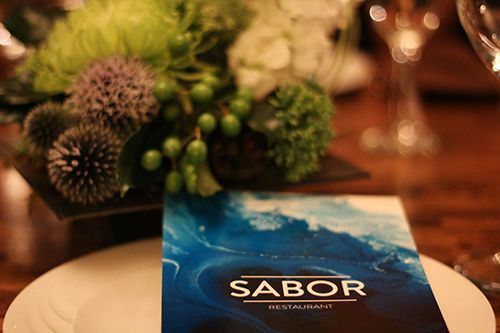 They've rebranded themselves as Sabor Restaurant and are committed to continue supporting local and using sustainable ingredients. The feast that evening was of epic proportions, with guests filling the entire restaurant. 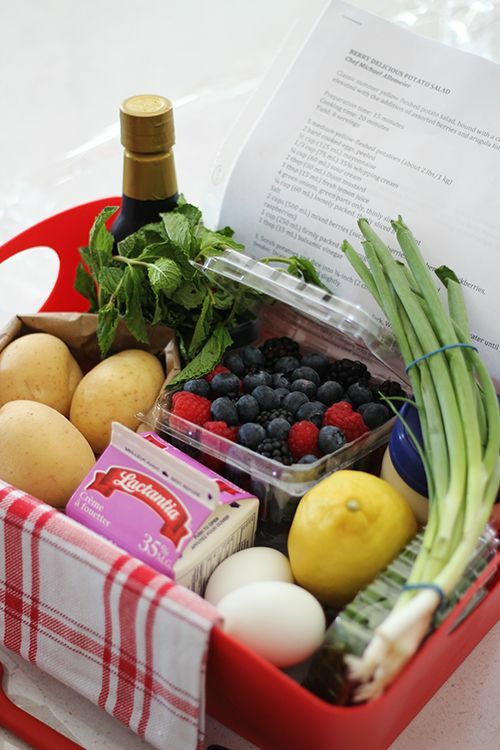 But before we get to the seafood, let's not forget about the little details. 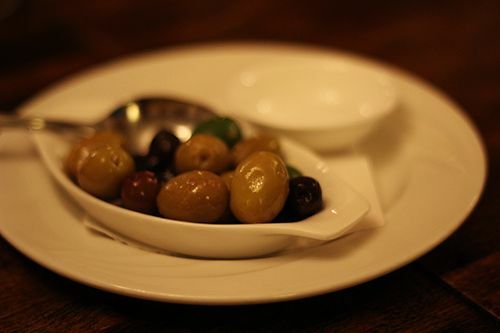 Plates of assorted olives sat along the tables for guests to enjoy with tapas. I've honestly been an olive hater for as long as I can remember. But I figured I would take the chance to sample the ones available and I actually found one that I enjoyed. I was able to learn quite a bit about the olives from my table mates and loved the briny flavour and firm texture to the light green ones. Doesn't hurt to take a chance once in a while! The meal was served family style from beginning to end, starting with tapas. 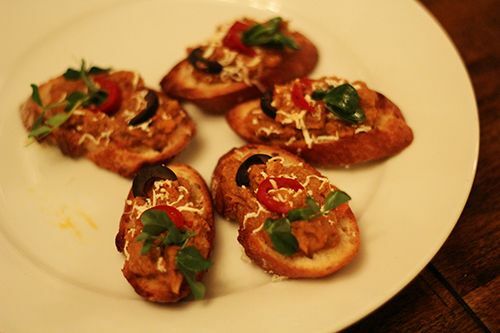 The first dish to come out was with Sardine Pate Crostinis. Sardines don't get a lot of love from restaurants and Sabor highlighted these little fish very well. The pate had a briny flavour akin to that of tuna and was incredibly smooth. 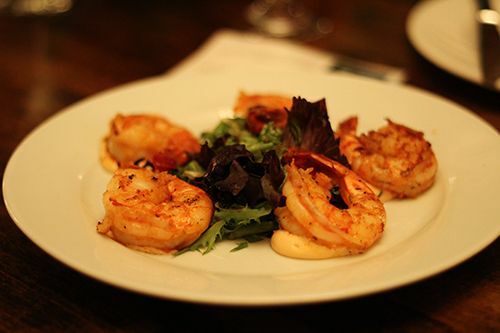 The next dish to come out was the Piri Piri Prawns, which is a signature dish here at Sabor. Prawns are marinated in their mix of Piri Piri spice and cooked to perfection. I love the spices chosen for the shrimp and you get a great kick of heat from the dallop of sauce underneath. I could honestly just sit and eat these and be happy! Our next appetizer was a one bite Wild Arctic Char Tartar with avocado and pimento aioli. The fish itself was fresh and creamy with the aioli, but didn't have much flavour. It allowed the true flavour of the fish to come out and a bit of briny flavour came from the roe garnish. Bacalhau (Salt Cod) cakes came out next and they resembled little eggs to me. 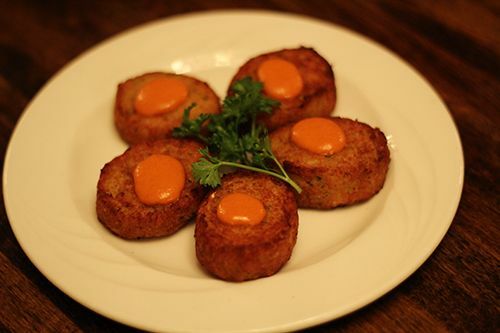 I usually find that salt cod can be quite dense and stiff, but Sabor managed to make the fish cakes quite light. I loved biting into the crisp exterior to find the flaky fish on the inside. The next plate featured was an Octopus Salad. 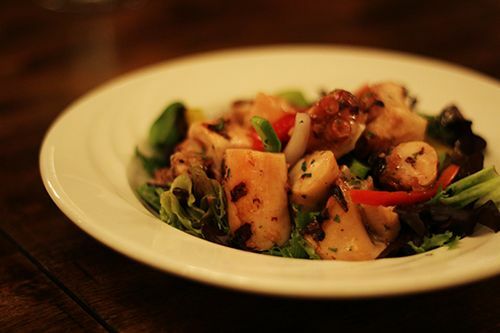 A generous serving of grilled octopus was served on a bed of greens with peppers and red onion. The octopus itself was treated well and cooked to a tender, non-rubbery consistency, but it still had a fair amount of chew to it. I felt that the dish itself to be a bit bland and would have loved if the octopus seasoned with a heavier hand. Scallops are one of my favourite seafoods so you can imagine how excited I was for this plate of Bay Scallops with Cauliflower Puree. 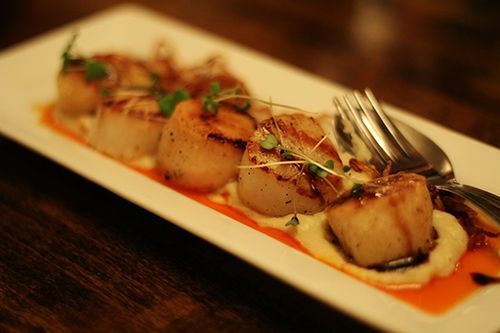 Each scallop had been perfectly seared and you could really taste how fresh each one was. The cauliflower puree was smooth and flavourful, similar to mashed potatoes. It would seem that these tapas plates were never ending but our last one for the evening was Grilled Calamari with lemon and spicy tomato. Warm and slightly smoky, this was one of my favourite dishes of the evening. I loved the slight kick of heat and the balanced acidic flavours of the calamari. 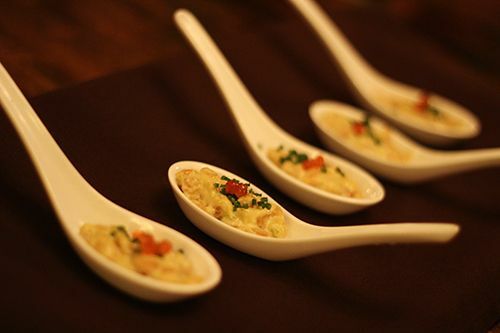 To kick off the main courses everyone had their own serving of Sabor's Signature Lobster Risotto. 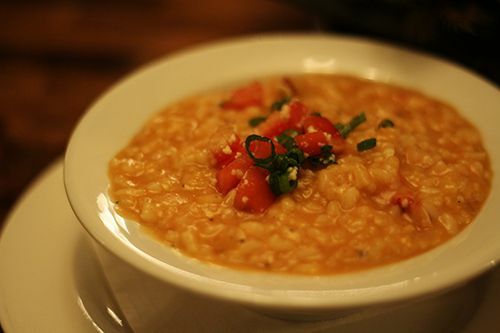 I have had this creamy risotto many times before and always love how rich the lobster makes this dish. Beneath the surface lay chunks of lobster and they're seriously the best surprise! 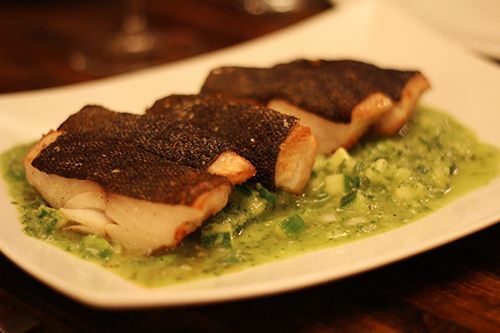 Pan Roasted Sablefish with cucumber green onion salsa was probably the one dish that got everyone talking that evening. Sablefish itself has quite a high oil content which makes it a fish that tastes buttery and flakes readily when cooked. The fish was cooked to perfection, but the salsa beneath is what made this dish outstanding. The acidity of the salsa cut the oiliness of the fish and added a different texture to each bite. Everyone I talked to raved about this dish! With everyone at the tables absolutely stuffed, one last dish arrived at the table. My eyes ogled at the heaping pile of seafood in the bowl and there was so much in there that I didn't realize it was a classic Seafood Paella. A mixture of scallops, shrimp, mussels and clams sat overtop the slightly spicy saffron rice and ended off the entrees right! 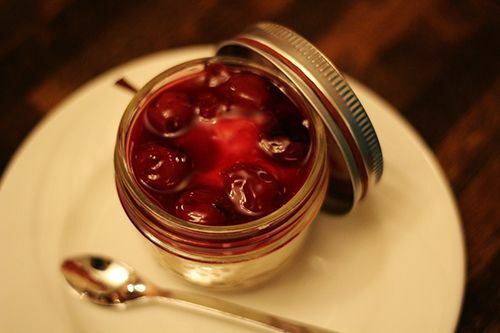 Because Sabor Restaurant knew that everyone would be exploding by the time dessert arrived, their Cherry Port Cheesecake was presented in a take-home mason jar as the final course. The cheesecake was light and fluffy and the preserved cherries weren't too sweet, making this a perfect small bite dessert. I've said it before and I'll say it again: Sabor is one of my favourite restaurants to dine at in Edmonton. It's a top restaurant based on their use of quality ingredients, top-notch hospitality and commitment to sustainability. I've never had a bad experience at the restaurant and I am always able to count on the culinary team for a fantastic meal. The seafood festival is running now through to September 14th, so if you're a seafood lover like me, it's time to pay the restaurant a visit! Most of the dishes featured that evening, or variations of them, are available on the Seafood Festival menu (view here). With the restaurant being 100% Oceanwise Certified, you can dine without worry - go out, eat, and enjoy! Remember a while back when I said I was working on a special project with Cavalia? I'm so excited to say that today is the day I can share the secret with you! Back in July Michelle (of The Tiffin Box) and I were given the opportunity to collaborate with Odysseo to shoot a behind the scenes video with the cast and crew of Cavalia's Odysseo. We wanted the video to give everyone a look at what it takes to put on this huge travelling production and to see the show from a different perspective. I attended the show on opening night before shooting this video and I can honestly say that I did not realize the magnitude of work that is done behind the scenes. As you find out in the video, everyone is such an integral part of the guest experience and they all work so hard to put on a spectacular show. It's no easy task, and they pull it off so well every time. I've seen the show twice now and can say I was truly blown away by the show itself and the hospitality. 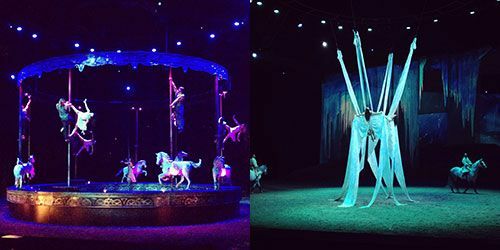 The acrobatic skill, riding techniques and of course the horses make it a must-see production. By popular demand, the show has been extended until August 31st and you can buy your tickets here. I promise you won't regret it! 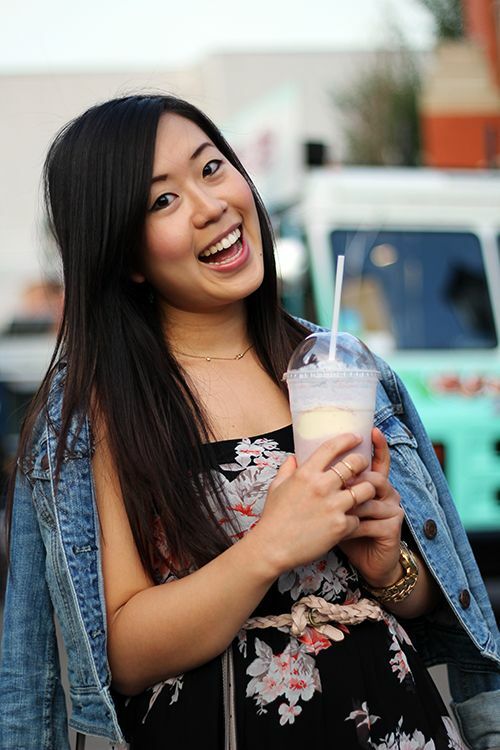 See Michelle's post here for her recap & additional photos! Thanks for following along and watching the video. Hope you enjoyed! 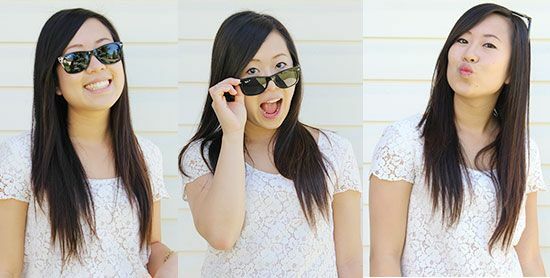 The summer weather lately has been amazing - hot, sunny days with blue skies and often not a cloud in sight. 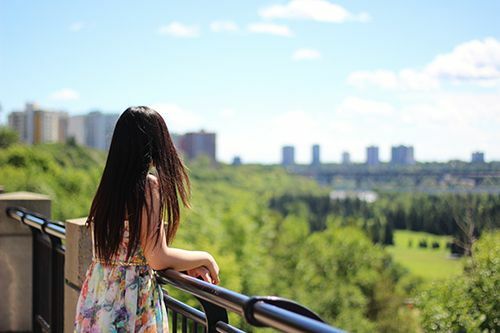 There's so many spots in Edmonton where you can just sit and enjoy the sunshine, but one of the most beautiful spots has to be on the Victoria Promenade. 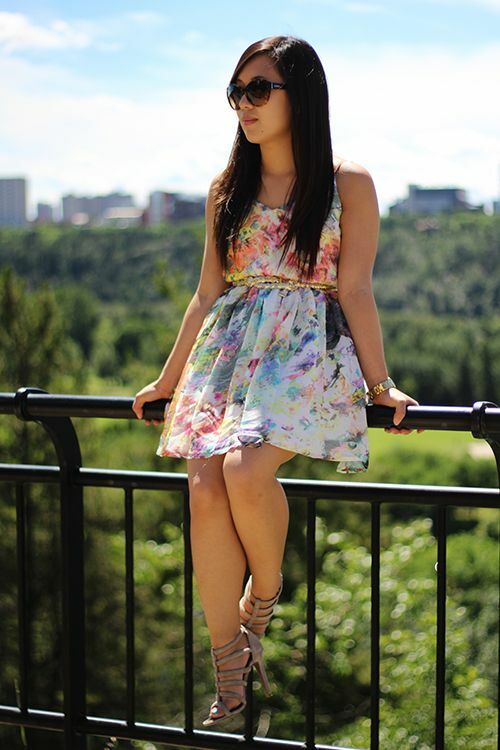 You get amazing views of the river valley and the south side of Edmonton, and it is just so peaceful. 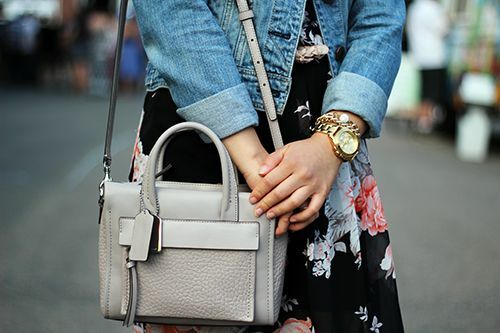 With the weather being so hot I've been loving light summer dresses and this one with the abstract floral print was perfect for a stroll down the promenade. Sunglasses, sandals and boyfriend in hand made it 100% better. Hope you're all enjoying the sunshine just as much as I am!